Wirelessly stream sound directly from the PH550 projector to a Bluetooth compatible sound system like home audio speakers, headphones or portable speakers to pair big sound to the big viewing experience. The PH550 has a wireless mirroring function that connects it to a smartphone or a tablet accessing content for projection�. It also can display movies, pictures, music and even office documents on USB drives too. Take the PH550 projector anywhere, anytime without fumbling with cords or clunky power adapters, and enjoy up to two and a half hours of use. 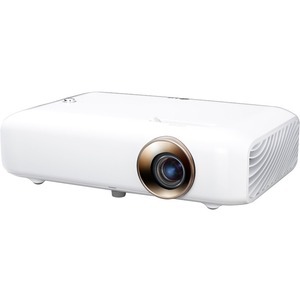 LG PW1500 is an LED projector with TV functions. Receive over-the-air TV signals to enjoy real-time sports games and TV shows. This projector's pure LED lamp displays natural and rich colors, and will last up to an estimated 30,000 hours. It means that the lamp does not have to be replaced for 10 years even if the projector is used 8 hours every day. Pictures are sharper. Colors are more vibrant. Entertainment is more real. Everything looks better in high definition.